Event submission is open for Gen Con Indy. They’re aiming to break their 2010 record for gaming events. Gen Con Indy is one of two big conventions happening this weekend in the United States (the other is Creation’s Official Star Trek Convention in Vegas). 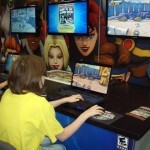 If you’re a gamer, Gen Con Indy is definitely one of the “must attend” conventions each year. Not surprisingly, it attracts at least 90,000 consumer and professional attendees. And did we mention Felicia Day and Wil Wheaton will be there?